Zali kicked off the event by introducing the panel and passing over to the first speaker Dr Sophie Lewis. Sophie talked us through her background studying Physical, Environmental & Maths Sciences and in particular the effect on the climate here in Australia. She helped the audience see the rate at which our climate has been affected over the last one hundred years and what that could look like if we continued at the rate we are. This was made tangible to the audience by marking on the graph when her daughter was born and how much it had already escalated from then until now. Next speaker was Assistant Professor Renate Egan from the Australian Centre for Advanced Photovoltaics at UNSW. Renate gave a positive insight into some of Australia’s world leading technologies and studies into Solar. 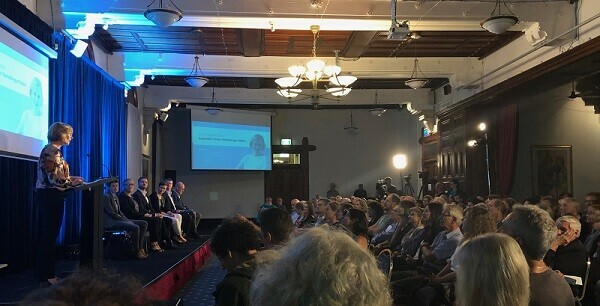 She helped share some interesting facts of innovation from here in Australia and the depth of opportunity we have for investment in Australian renewable technology. Anna Freeman the Director of Energy Generation at the Clean Energy Council used her time to talk through utility scale solar and wind farms. Her speech gave a very positive look into some successful stories of projects around Australia. One being the Sapphire Wind Farm and the amazing effects it had on the local community. She stressed the importance of investment into our current grid infrastructure and how it will be integral in our transition into 100% renewables. Tim Buckley the Director of Energy Finance Studies gave the audience a look into the clean energy transition that has occurred in India. He talked through a lot of highly relevant facts as to why that transition has been so successful. He backed it up with some very important facts that made it clear that Coal and Thermal Energy had no place in our planets economical future, let alone in its environmental future. 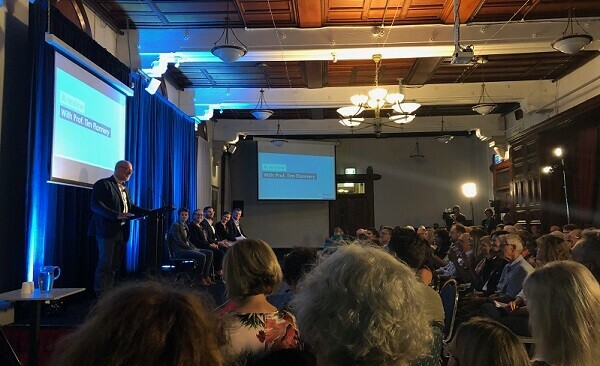 Last speaker of the evening was none other than leading Australian climate change author Professor Tim Flannery. Tim broke down the effects of carbon dioxide on our climate and ecosystem and helped relate that to natural disaster rates here in Australia and the effects it has already had. 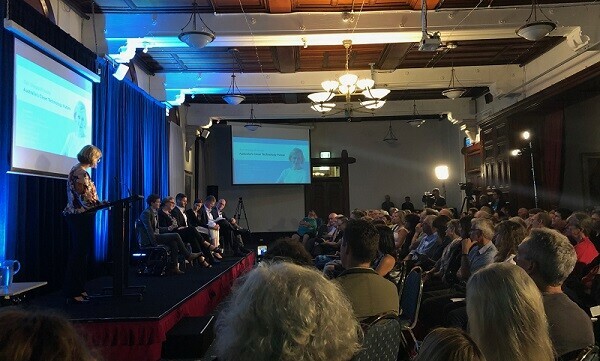 He also touched on some of the effects he has witnessed first hand over in the Pacific Islands, but really made it hit home with the audience by talking through the effects everyone can relate to such as our great barrier reef and natural waterways. Following these talks the panel engaged in a Q & A with the audience. It was amazing to see such a knowledgeable panel help breakdown some misconceptions we hear day to day in the media and help offer insight into the current progress in other countries, our opportunities and the what the future will hold. Zali wrapped up the evening by talking us through why she was personally passionate about a clean energy future and stressed the importance of why we need to look to experts for advice on climate change and not politicians. 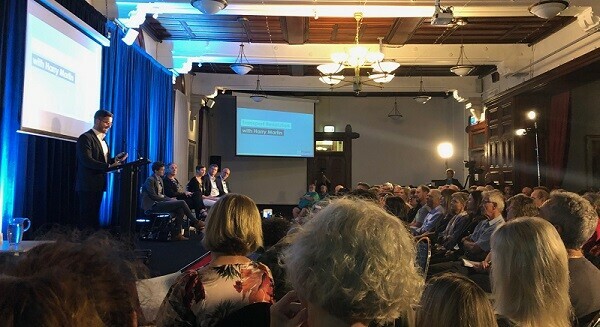 She talked through the need for strong federal policies around carbon emissions, climate change and renewable energy and for this to happen we need to “get rid of the handbrake” which was met with an uproar of applaud by the entire audience. Previous post: Commercial solar financing: Cash, loan, PPA or operating lease?